Growing up I thought brussels sprouts were foul. I could always tell when my mom was making them because the house would smell like boiled cabbage, gross. She would cook them until they were gray and mushy so I guess it isn’t surprising that I couldn’t stand them. Fast forward a few years when I came to the realization that it wasn’t brussels sprouts I hated, just the way my mom cooked them. As an adult, I realize that my mom wasn’t the most sophisticated cook and that I needed to go back and give some of my hated foods another try. 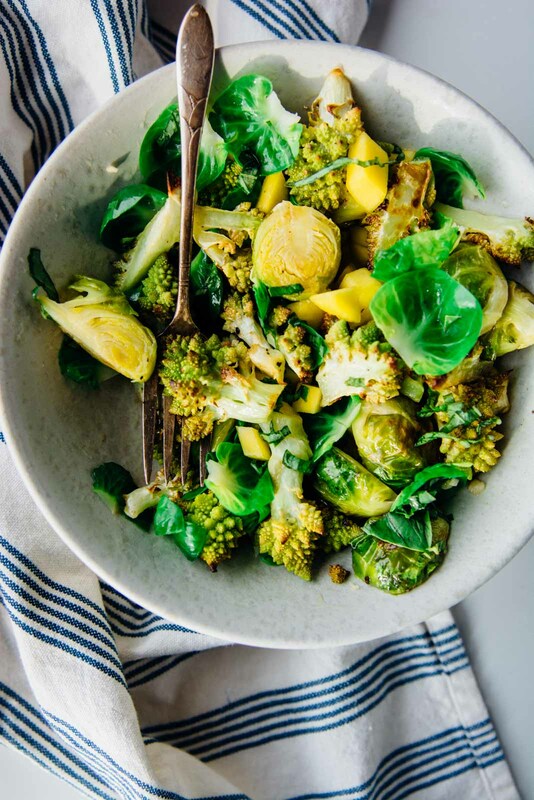 Brussels sprouts are now one of my very favorite vegetables, especially when they are roasted over high heat and smothered with a spicy fish sauce vinaigrette. 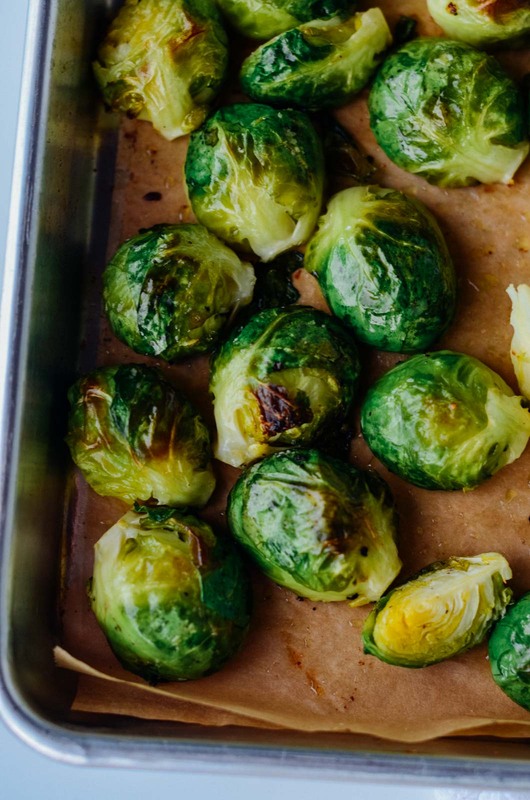 Sweet, salty and a whole lot funky this is my favorite way to eat Brussels sprouts. I’ve made quite a few variations of this salad and you can easily make substitutions based on what’s available to you. 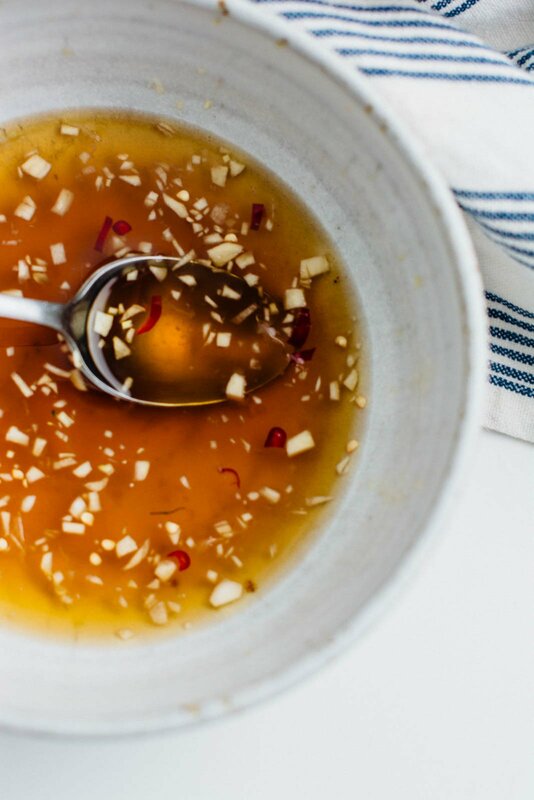 If you are vegan and don’t eat fish sauce, you could substitute with soy sauce, but I’d reduce the amount to two tablespoons. 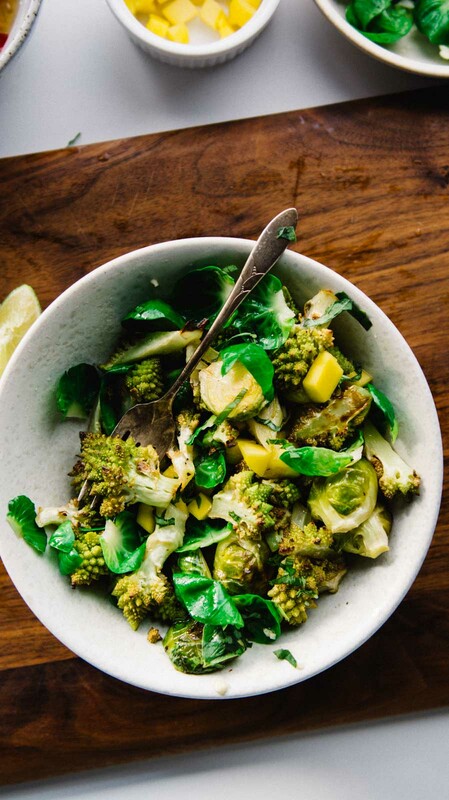 To round out the dish I added a head of romanesco, but if you have a hard time finding some, cauliflower makes a great substitution. The mango helps balance out all the saltiness, but any citrus would make a good replacement, and blood oranges work particularly well here. I would be overjoyed to eat this every day of the week. A bit of baked tofu, shrimp or chicken will make this a complete meal if you want something more substantial. 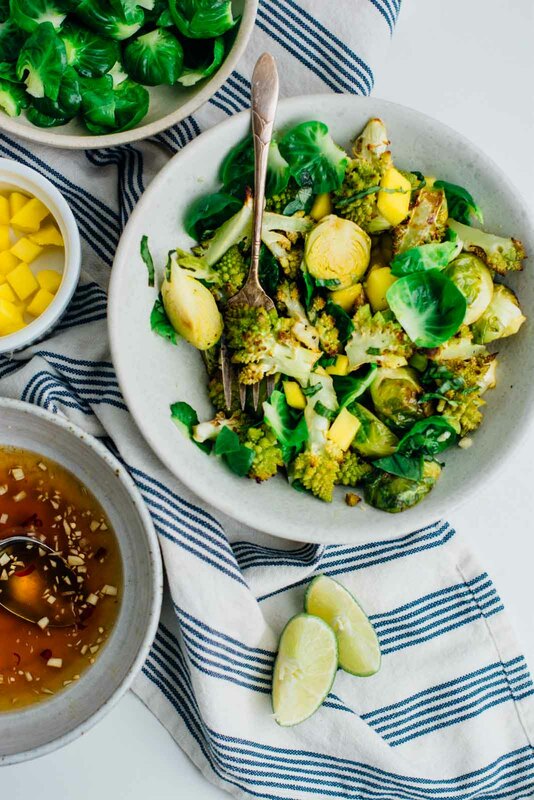 These roasted Asian Brussels sprouts are sweet salty and a little bit funky thanks to the fish sauce vinaigrette and fresh mango. Pre-heat the oven to 425 degrees. Prepare the Brussels sprouts by washing and trimming them, remove about ½ cup of the outer leaves to finish the salad with. 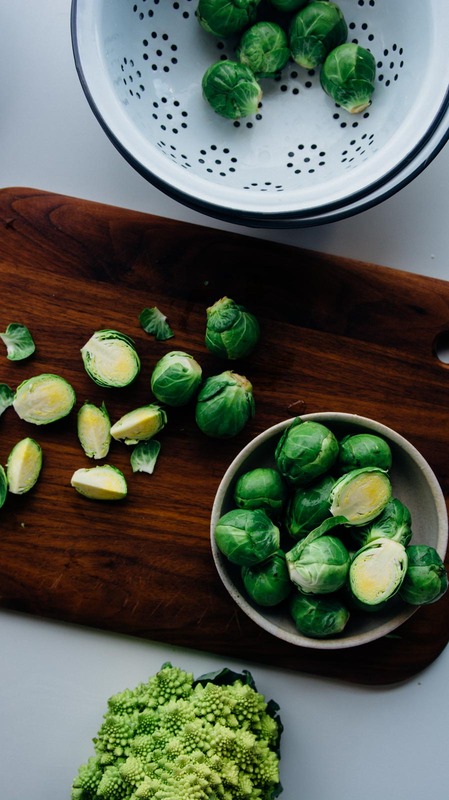 Cut the sprouts in half from stem to top and place on a baking sheet. Separate the cauliflower into florets and place on another baking sheet. 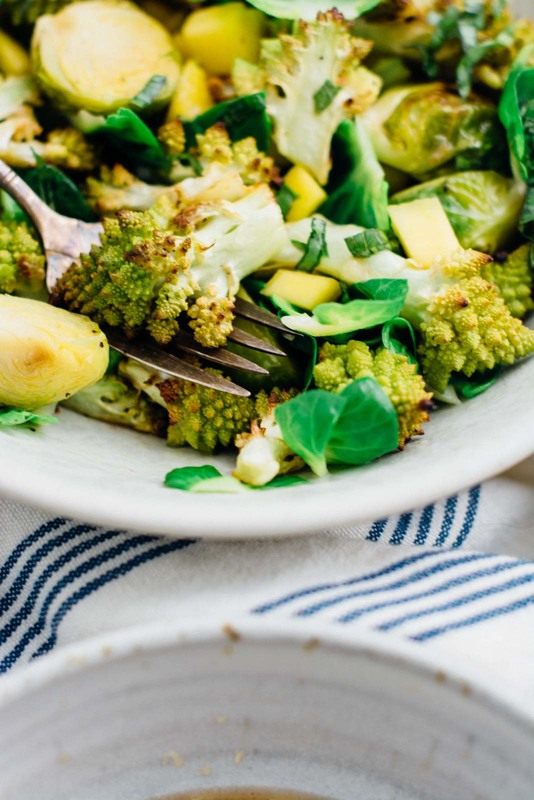 Toss the vegetables with the 2 tablespoons of olive oil and season with salt and pepper. 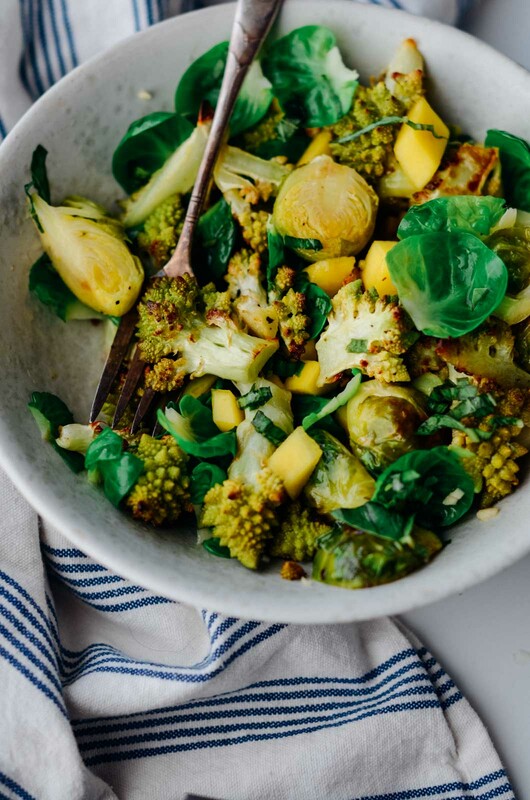 Roast the vegetables until caramelized and tender about 20 minutes. 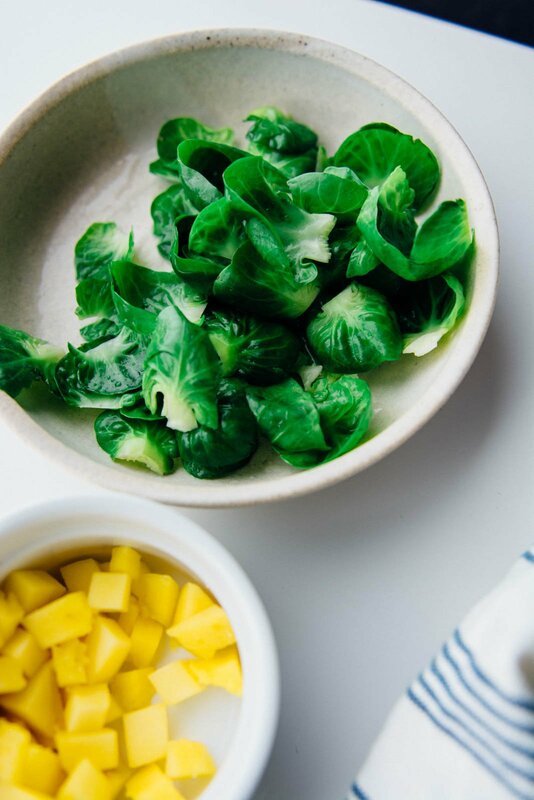 While the vegetables are roasting, blanch the reserved brussels sprout leaves in a pot of boiling water for 30 seconds. Immediately add to an ice bath and pat dry. 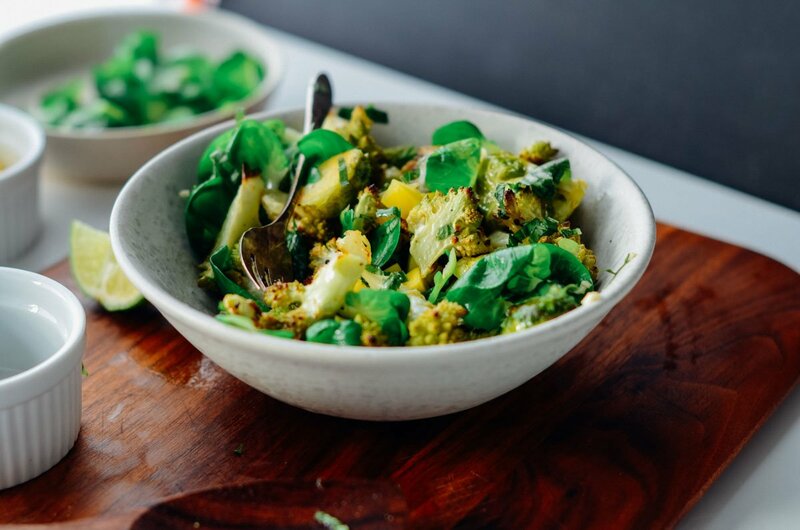 Make the dressing by whisking all the ingredients in a bowl. 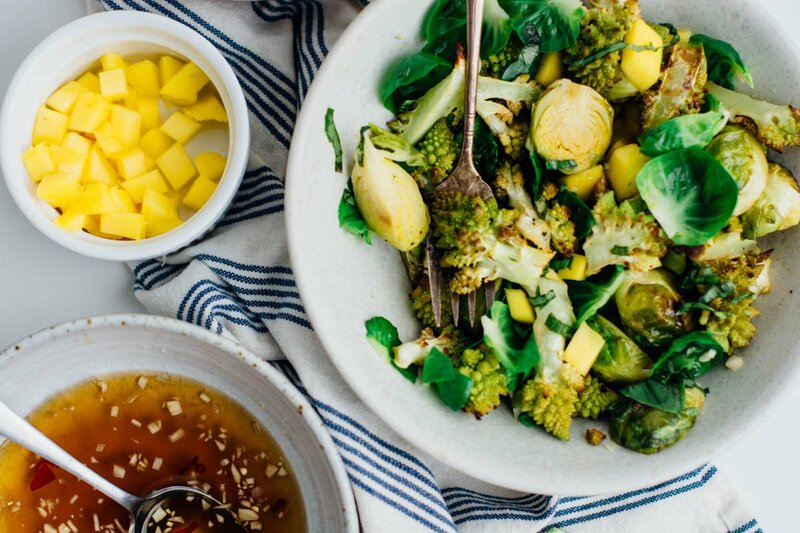 To compose the salad, toss the vegetables with the dressing and scatter the mango and herbs over the top.